Carbohydrates are a macronutrient found in many foods and beverages, and there are three main types of carbohydrates: fiber, starch and sugar. Fiber carbohydrates are made of sugar units bonded together and occur naturally in cooked dry beans, fruits, vegetables and whole grains. Starch carbohydrates are made of sugar units bonded together and occur naturally in cooked dry beans, grains and vegetables. Sugar carbohydrates, the simplest form of carbohydrates occur naturally in fruits, milk and milk products and vegetables. A diet offering an optimum level of carbohydrates, and from foods which offer a variety of other important nutrients, promotes good health. In the body, carbohydrates are vital to health for several reasons, including providing energy and protecting against disease—evidence shows that dietary fiber and whole grains foods help reduce the risk for cardiovascular diseases. And fiber may help protect against obesity and type 2 diabetes. Carbohydrates may also help control weight when a diet consists of fruits, vegetables and whole grains. 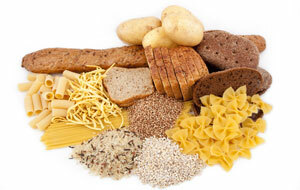 And carbohydrates play an important role in the function and structure of the body organs and nerve cells. To maintain good health, choose carbohydrates wisely. Limit foods that contain added sugars and refined grains, such as sugary drinks, desserts and candy. Instead, choose fruits, vegetables and whole grains.